Solidarity on Tap is a simple interfaith intergenerational gathering for socializing and social justice. 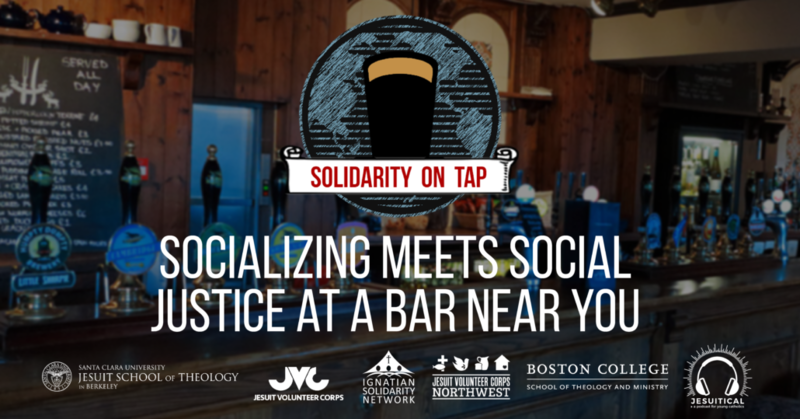 The Ignatian Solidarity Network, Jesuit Volunteer Corps, Jesuit Volunteer Corps Northwest, Jesuit School of Theology of Santa Clara University, Boston College School of Theology and Ministry, Jesuitical and local partners welcome all to Solidarity on Tap | Cleveland. Beverages (alcoholic and non-alcoholic) will be available for purchase. All are welcome (21 and over). Around 7:30 PM, we will have a reflection titled “Don’t Trash Recycling: A Practical and Ethical Look at Stopping the Global Waste Culture” by Kathleen M. Rocco, Education Specialist for the Cuyahoga County Solid Waste District, and Brenna Davis, Educational Resource and Environmental Justice Coordinator for the Ignatian Solidarity Network. Kathleen has been the Education Specialist for the Cuyahoga County Solid Waste District since fall of 2000. She has visited hundreds of classrooms and youth groups sharing an environmental message of reduce, reuse and recycle with over five thousand students annually. Through outreach efforts to civic groups, institutions and interested individuals, Kathleen teaches about composting, recycling, and more to achieve a healthier and more sustainable lifestyle. Kathleen manages Master Recycler volunteers after facilitating an intensive training for them. Over the years, Kathleen has contributed her time and expertise on projects for educational and environmental organizations. Currently, she assists the Ohio Association of Litter Prevention and Recycling as President and Green Schools Committee of Northeast Ohio United States Green Building Council as Chair. Kathleen has completed a Masters of Environmental Studies through The Institute of Environmental Sciences from Miami University and a Bachelor of Science in Biology from the University of Dayton. Please select... Deacon Dr. Fr. Mr. Mrs. Ms. Msgr. Prof. Rev. Sr.
What is/was your graduation year?